If you’ve been in the entertainment industry long, you know Murphy’s Law tends to ring true. Heck, even if you’re brand new to the industry, your time on this planet has likely proven to you that anything that can go wrong, will go wrong. Even if you’ve planned every last detail meticulously, there will always be something that doesn’t go according to plan. These things are often beyond your control. However, what you can control is how it impacts your event (and your bottom line). You can do this by being prepared for every possible scenario…even the “never-going-to-happen-not-in-a-million-years” scenarios. Hundred-degree heatwave in Fargo in the middle of February? Have a plan. Blizzard in Miami? Have a plan. Giant asteroid? Elephant stampede? Aliens? Have. A. Plan. We’re in the business of expecting the unexpected. Especially now that climate change is making weather less predictable and increasing incidences of severe weather. In addition to planning for a range of “typical” weather in your area during the time of your event, it’s important to have a severe weather plan as well, since it can have the most detrimental effect on your event. Below, we outline six things to include in your severe weather plan. Every event, every venue, every crowd and every storm is different. What is considered severe weather at a craft fair or golf tournament may not be considered severe weather at a heavy metal concert or a half-marathon. Additionally, while you should heed warning from officials, you shouldn’t wait for the national weather service to declare severe winds before you evacuate. If you think your tent is about to blow over, use good judgement and get people out of there. 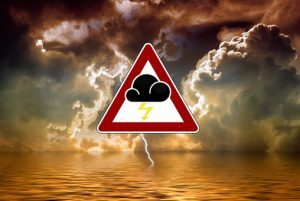 List every type of weather that could impact your event and then how severe it needs to be before you do something about it. Then determine exactly what that something is. Maybe it’s roll down the walls of your tent, or maybe it’s cancel the event altogether. Define what occurrences would warrant an evacuation. What will you do with attendees? What about equipment? You need to know where to direct people during an emergency and how long it takes to get there. You should also know the structural stability of every structure in use at your event, so you know what extent of wind, hail, etc. it can handle. Once you have a plan for the people, you can draft a plan for what to do with your equipment. How will people know what to do in the event of severe weather? Have several messages scripted and ready to go for different situations, but also be prepared to write incident-specific messaging on the fly. Keeping Murphy’s Law in mind, have multiple means for communication, including audio, visual and digital (i.e. text alerts). It is also important to designate one, and only one, person to communicate with the media and other parties, and make sure that all others know to refer all inquiries to that person. Everyone involved in the planning and execution of the event needs to know and practice what to do in the event of severe weather or another emergency. The more they practice, the calmer they’ll be and the fast they’ll act if an actual emergency occurs. During practice exercises, time how long it takes to prepare for severe weather and remember that it will always take longer than you expect once attendees are involved. How will you determine if/when the event will resume? Was anything damaged? Do safety inspections need to be performed? Can you postpone? Do you have an alternate venue? How will you let attendees know whether the event will resume? Knowing the answers to these questions ahead of time will make these decisions easier when you’re under pressure and everyone’s waiting on you to make the call. Outdoor events are inherently risky. While the five steps above will help prepare you to weather the storm, they don’t offer much in terms of financial security. Event insurance policies can protect you from everything from low attendance due to bad weather to backup indoor venues to cancelled ticket refunds. Click here or contact us to learn about your options. It’s important to understand that no event is the same and it’s up to you to determine what weather your event can handle—and make contingency plans for the weather it can’t. While you aim to please attendees who came out to enjoy a great event, their safety is your number one priority. And remember, if everything is going well, you’ve obviously overlooked something.